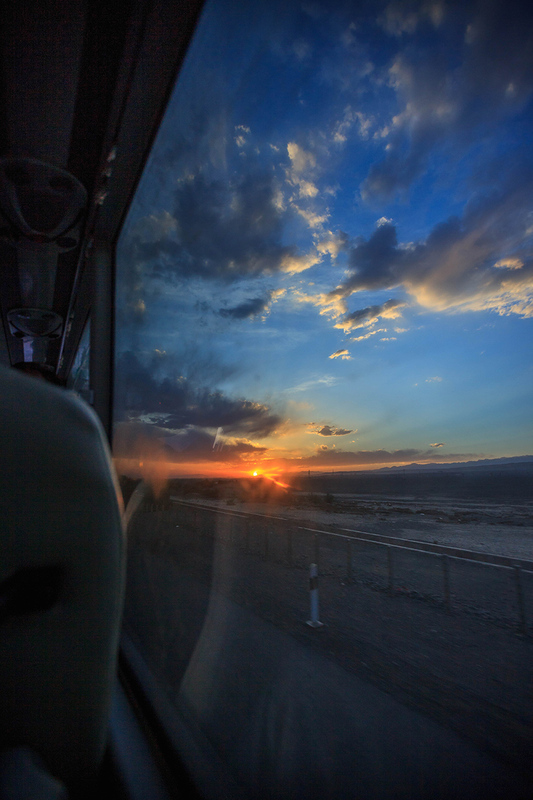 After I got my visa extension, I then rushed to get to Xinjiang by bus. I was first thinking to ride some kilometers in Gansu Province, from Zhangye to Jiayouguan, but looking at the time left for me in China, I rushed straight towards Xinjiang by bus. I have only a month now from the visa extension in Xi’an, so I was thinking to spend all the time in the far west of Xinjiang, riding in places that I never ride before. I used to ride from Xining to Urumqi passing by some parts of the silk road before in summer 2010 with Nancy, passing by special places like Dunhuang and Turpan, so I’m not gonna do the same route again. While in the bus, I was talking to the bus driver about my journey. He then suggested me to skip Urumqi now since the city is a bit too tense due to the bombing that killed many people in the main bus station there, and there are so many police and army patrolling there. So after hours of thinking inside the bus, I then decided to get to Aksu, a town in the Taklamakan Desert and start my ride there towards the far west of Xinjiang. So there you go, I then went through another tough challenge of the journey. I spent more 50 hours in 3 days inside the bus! It was very tiring! I got to Aksu from Xi’an on 3 different buses. I spent 10 hours of bus ride from Xi’an to Lanzhou and slept a night there. The next day, I took another bus from Lanzhou to Urumqi, a long 28 hours of hellish bus ride before taking only an hour rest in Urumqi before taking the third bus, which took another 16 hours to Aksu. And it didn’t stop there, I reached Aksu only to discover that the guesthouses and hostels there don’t accept foreigners. So there you go, I spent another 4 hours of cycling around the very dusty town just to find a place to rest and sleep. Usually when I reach a town, I will look for cheap hostels to stay. This time though, I was searching for hotels! I was so frustrated since even some cheaper hotels, which costs about 120 yuan per night don’t accept foreigners too! They actually force foreigners to stay in expensive hotels only. 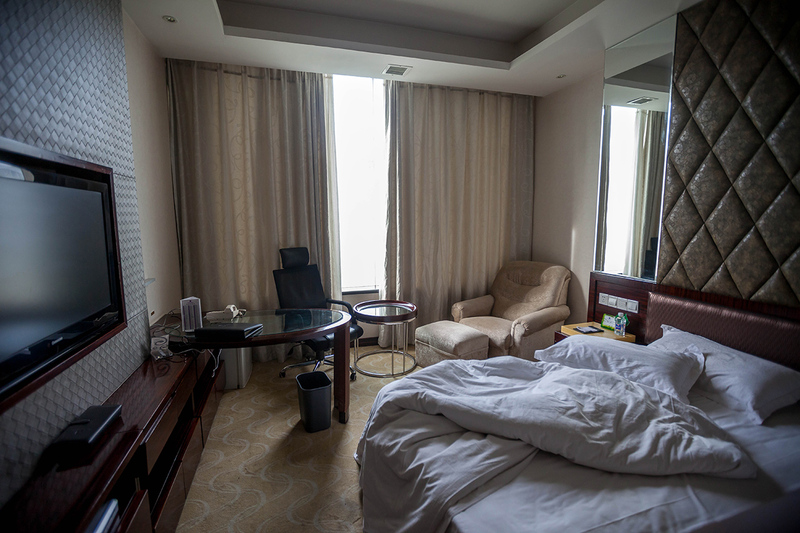 I then found a hotel, which accept foreigners and wanted to charge me nearly 500 yuan per night! Gosh, then what do I eat after that… the sand of the Taklamakan Desert? After hours of searching and I was getting weaker and tired and hungry, and the raindrops started to hit my face, I finally found and settled in a hotel that accepted me with 220 yuan per night (roughly 120 ringgit our money). Since I paid so expensive just for a hot shower and a nice bed to sleep, I better really make full use of it. So I really took a long shower like someone who never takes shower for 2 years, and sleep really well in a nice bed like someone who never has a chance to sleep in a bed in his whole life! hehe.. a nice luxury hotel for a nomad! I spent a day taking a good rest in Aksu after the long bus journey. Don’t really like it here, didn’t even film or snap a single photo here, I don’t feel comfortable taking out my camera in this town since it looks really tense, police and army everywhere here. Maybe because of the bombing that happened in Urumqi, it affects the whole province of Xinjiang I think. I just went out to find food and to top up my local phone credit, then back to my hotel room. I had seen the town when I was cycling for 4 hours searching for a place to sleep anyway, so I had enough of it. And some people here, after knowing that I’m from Malaysia, they can simply joke about Malaysian people doesn’t know how to fly a plane. I then just laughed together with them, since I don’t know how to explain it to them with my very broken Chinese, plus I’m tired of it anyway. Back to the bus journey though, it was very difficult since I have a bicycle with me and had problems communicating while purchasing the ticket at the counter to explain that I have a bicycle with me and had to pay extra for it. But somehow, the hospitality of the locals is always… always amazing. Seems that they know how hard it is to travel alone in a foreign land where you don’t understand the local language. People just coming up to me out of nowhere from the crowd like an angel, helping me out without asking anything in return. Then they left, disappeared back into the crowd after they have helped me. I wonder sometimes, are they really human or maybe they’re angels, helping me out when I’m having such a hard time. And the second bus driver, the one that drove from Lanzhou to Urumqi, it looks like as if he knows that I used to ride here before. He chose the same road that I used to ride 4 years ago to get to Urumqi. While on the bus, I kept admiring the landscapes and magically, I still remember each places that I used to stop to pitch my tent! Such nostalgia, I wish I could stop and snapped pictures on exactly the same place I used to snap 4 years ago so that I could compare. ← Hua Shan, the mountain of magic! This was a lovely story thanks for sharing. I was tired just reading about your multiple bus journeys and Aksu sounds quite hostile, but hopefully from here you can get back on the bike and enjoy the scenery again! your blog never fails to astound and amaze! I have to say, I think that many bus journeys over so few days would have killed me! Alhamdulillah you are safe . Was wondering if you are OK since did not hear from you so long . May Allah SWT protect and guide you for a safe journey till your return to Malaysia .